Last week we learned about the experiments performed by Pons and Fleishmann in which they used heavy water to create deuterium by running a current through it. Then a palladium electrode would absorb the deuterium where it was claimed that fusion took place, releasing more energy than what was put into the system. Sounds great, right? Energy so cheap it wouldn’t even be worth metering. But shortly after their press conference, problems began to develop. The first problem was that they were not able to propose a mechanism for how fusion could occur at room temperature. In order to fuse atoms, one must overcome the substantial electrostatic force when you try and bring two positively-charged nuclei close enough together so that the strong nuclear force will be able to act upon them. Normally it would require temperatures in excess of 120 million °C. To say that the deuterium gas is compressed 900 times by a palladium electrode isn’t going to even get you close. Consider, for example, the planet Jupiter which has a layer of hydrogen near its core that is believed to be in excess of 30,000 °C and pressure tens of thousands of times greater than normal atmospheric pressure on Earth, yet this is not enough to fuse hydrogen which is why the gas giant is a planet and not a star. Another problem was that their experiment was set up to measure heat and not the by-products of nuclear fusion, specifically neutrons, gamma rays, helium and tritium. In the following weeks, several labs were announcing that they could reproduce parts of the experiment, but not all. The Department of Energy could not reproduce the results. And despite all the claims, in the end there was never any solid evidence for the production of helium, gamma rays or neutrons. A few labs found small amounts of tritium, but not enough to be more than what could be explained by contamination. These labs were in the business of measuring nuclear products and thus had plenty of sources of possible contamination—something very difficult to avoid when you are looking for such low levels in the first place. It turns out that data had been altered before going to congress to appeal for funding. A graph had been fudged to match expected results. By May 1989, the gig was up. 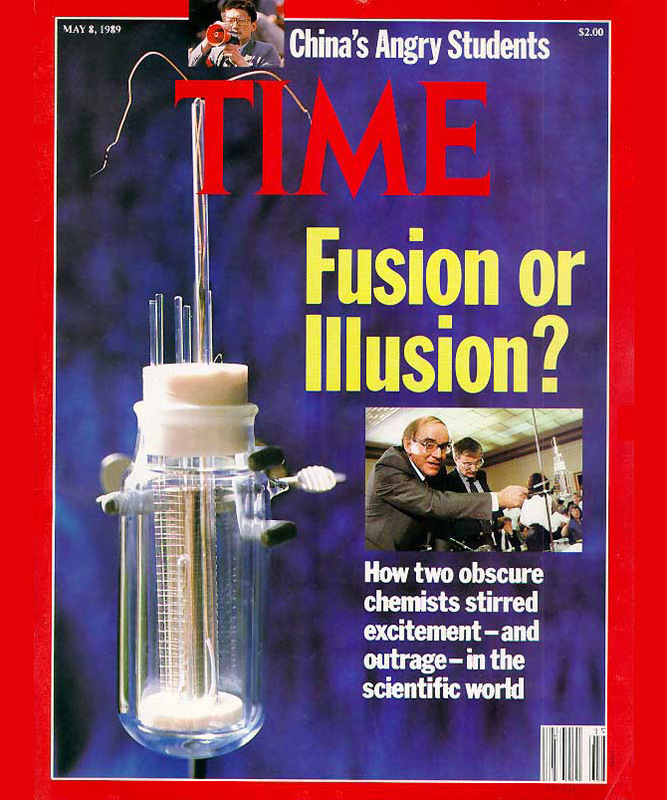 The American Physical Society held a session on cold fusion, at which many reports of failed experiments were heard. At the session’s end, eight of the nine leading speakers said they considered the initial Pons and Fleischmann claim dead. Steven Koonin of Caltech called the Utah report a result of “the incompetence and delusion of Pons and Fleischmann” which was met with applause. Physics Today, in a 2005 report, stated that new reports of cold fusion were still no more convincing than 15 years previous. Its a good reminder that we must always rely on the scientific method to arrive at the truth.